When I travel with my camera, it’s common for me to import photos to my laptop’s Lightroom catalog. Then I can keyword, label, and edit photos while I’m on the road. When I return home it’s necessary to merge the new photos from the trip with my main Lightroom catalog without losing any of my editing. The best way to do this is to export the new shoot from the laptop’s catalog as a separate catalog and then import that catalog into the main catalog on my workstation. You’ll need an external hard drive to handle the transfer. Plug the external hard drive into the laptop. Select the folder(s) you want to export and choose File > Export As Catalog. When the Export As Catalog dialog shown in Figure 1 opens, choose the external hard drive and type a name for the temporary catalog in the Save As textbox. 4. Choose Include Negative Files (which are your original files). Also choose Include Available Previews to save Lightroom from needing to recreate previews after you import this catalog into your main catalog. 5. When you click the Export Catalog button, Lightroom begins building a small catalog from the folders you selected. 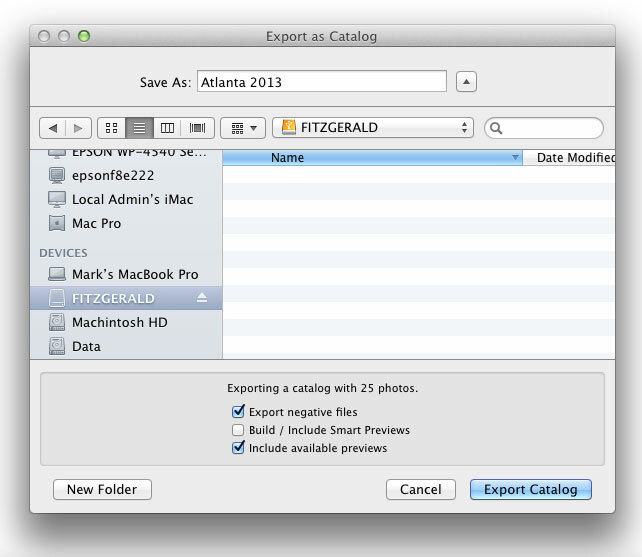 It creates a folder with the name you specified and includes files and folders similar to those in Figure 2 that were created when I exported a folder of photos from Atlanta. The data file contains the exported previews, the folder (named Photos in my case) contains the original files, and the file ending with .lrcat is the exported catalog. 6. Now you can eject the hard drive and use it to import the catalog into your main catalog. Follow these steps to import the transitory catalog into the main catalog. Plug the external hard drive into your main computer. 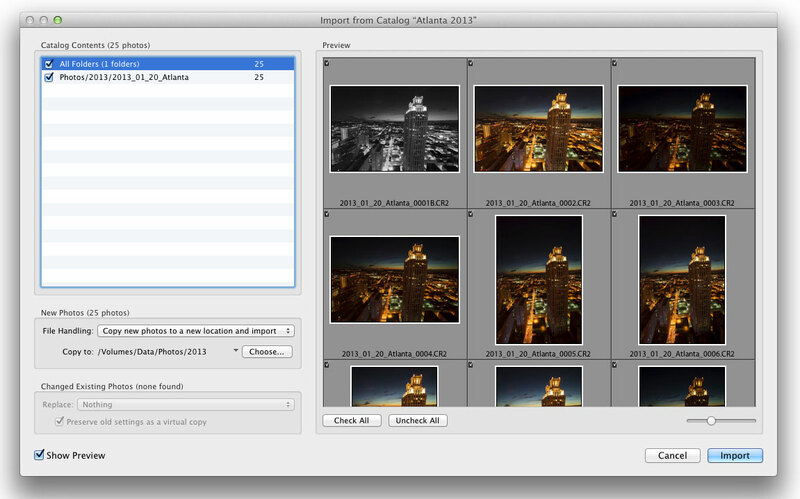 In Lightroom choose File > Import From Another Catalog. When the Import From Lightroom Catalog dialog opens, navigate to the external drive and select the catalog file with the .lrcat extension and click the Choose button. When the Import From Catalog dialog opens, choose Copy New Photos to a New Location and Import from the File Handling dropdown menu. Then click the Choose button and locate the place on your hard drive where you want to place the imported folder as shown in Figure 3. In my case I chose to place the folder in the 2013 folder on my Photos hard drive, which is where all of my photos are. Click the Import button to import the transitory catalog into the main catalog. After the process is complete, it may be necessary to tidy up the folders in Lightroom to get them exactly where you want them. That’s all there is to migrating a folder from one catalog to another catalog using Lightroom. Thanks for sharing your technique Mark. Super helpful reminder Mark! I’m going to copy over my new Keywords, too, as I came up with some new ones from my recent trip/shoot.